Fiat Chrysler’s visionary boss Sergio Marchionne has died, after having driven the Italian auto giant to success for 14 years, holding company Exor announced Wednesday. “It is with the deepest sadness that EXOR has learned of the passing of Sergio Marchionne,” the holding company, which is owned by the Agnelli family, said in a statement. 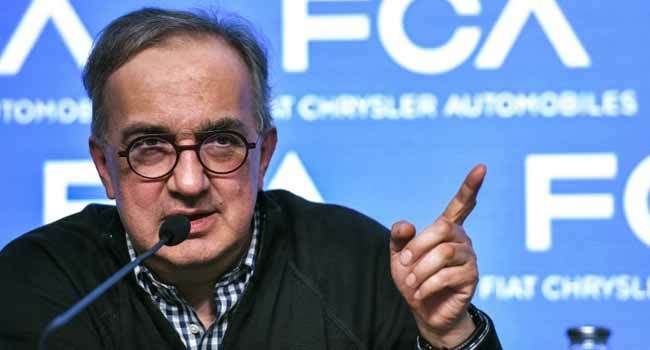 FCA had announced at the weekend that Marchionne, 66, was gravely ill in hospital in Zurich after suffering serious complications following surgery on his right shoulder last month. Marchionne is credited with revamping the company, Italy’s premier private enterprise, from top to bottom. In an indication of the profound impact that Marchionne had in Italy, members of parliament held a minute of silence in his honour, followed by applause. “Thank you for the work, the effort, the results. You spread Italian pride throughout the world”, former Italian Prime Minister Paolo Gentiloni tweeted. Marchionne, who brought Fiat back from the brink of bankruptcy, has been lauded by the Italian press since his serious condition was made known over the weekend. FCA has scrambled to put new management in place to take over his legacy. Marchionne will be replaced as FCA boss by Briton Mike Manley, head of the iconic Jeep brand. The new executive head of Ferrari will be Louis Carey Camilleri, CEO of tobacco giant Philip Morris. The cigarette-maker has sponsored Ferrari for four decades. Suzanne Heywood will take over as the new boss of CNH Industrial, which specialises in agricultural and construction equipment, trucks and buses. Marchionne had been planning to step down from FCA next year. Some experts have cast doubt on the ability of Marchionne’s successors to maintain the momentum he had built up over the years. His successor at the helm of the sprawling FCA, Manley, “is no Marchionne,” Dudenhoeffer said. But others analysts were more optimistic. “While the succession comes seven months sooner than we and the market anticipated, we nevertheless believe that the investment case for margin expansion and eventual strategic options remains intact,” said analysts for Barclays bank.